Choosing expository essay topics that links different element of the paper by being informative is an important step to hook the readers. The design of Writing Topics Generator is an easy to use interface, with users searching the available topics based on what they search. Expository writing is non-fiction with writers providing information and supporting their ideas to explain things. Since expository writing is preferred in academics, the essay topic generator has various suggestions based on the search terms. Searching the main ideas using the key words, the topic type and subject area allows the tool user to narrow down to the relevant topics to generate optimum results. Concerns that the essay topic generator prevents one from developing creativity are misplaced. The tool merely provides related topics based on the search terms, and the article. The creative writing process is mostly in the article, but then choosing a title that captures the essential elements of the article is necessary. Since the topic generator aggregates titles that are closely related the writer chooses the one that is creative. For teachers and students, the tool can prove vital to providing suggestions to choose from, and may generate other ideas that link to the topic. The free topic generator tool is updated regularly as more topics are generated, but one has to make a connection between the article and the topic. For instance, searching using the key word autism under expository essay generates topics that are not related to the topic, as the first results are most relevant to the topic. 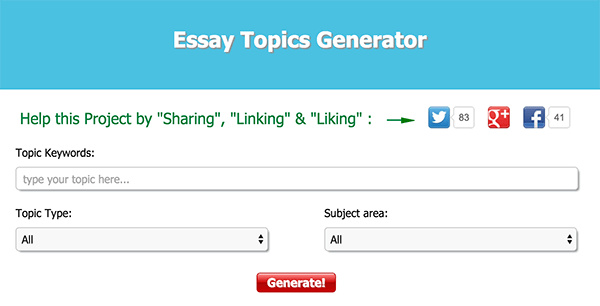 The topic essay generator is a useful tool for generating prompt topics that represent the link between two or more ideas. In creating content, writers choose topic titles that capture attention and with the tool generating suggesting great titles. This makes the tool a success in aggregating related topic titles.